Imagine a world where Coca-Cola is bottled in Pepsi containers. Imagine a world where Pepsi is put inside RC Cola cans. Imagine a world where the new Brand Promise is no promise at all. Welcome to Soda Prohibition. While there was no such thing as Soda Prohibition, unless you consider Mayor Bloomberg’s attempt to super down-size sugary drinks a qualifier, there was a prohibition on alcohol. Not some encouragement by the First Lady to plant flowers or get in shape (admirable, nonetheless) but an amendment to our Constitution. That’s some serious Messin’ with Sasquatch right there. So, what exactly is a Brand Promise? A Brand Promise is the assurance that Toyota means reliable (not so much lately). A Brand Promise is the notion that your McDonald’s Quarter Pounder will taste exactly the same every time everywhere. A Brand Promise is the guarantee that the Coke in your cola is “The Real Thing”. During prohibition, this sort of promise was such an after thought that you you might say some of the whiskey brands were, well, kinda slutty. So, what’s in a name? 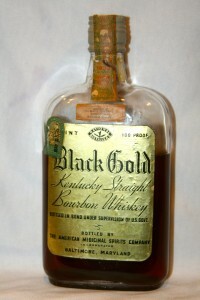 Enter Black Gold Whiskey. Put yourself squarely in the middle of the Great Depression. Times where tough, to put it mildly. 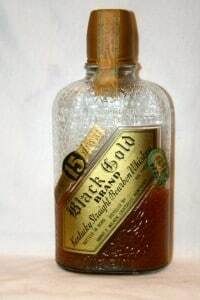 If you were lucky enough (or smart sick enough) to get your hands on some Black Gold, would you care where it came from, who distilled it, who bottled it, or who distributed it? Me thinks not. When I put myself in those worn out shoes I have to admit that I would be silly happy to get my grubby mitts on a pint of “Aged in the Wood” juicy juice no matter where it came from or how over aged and “oaky” it might be. 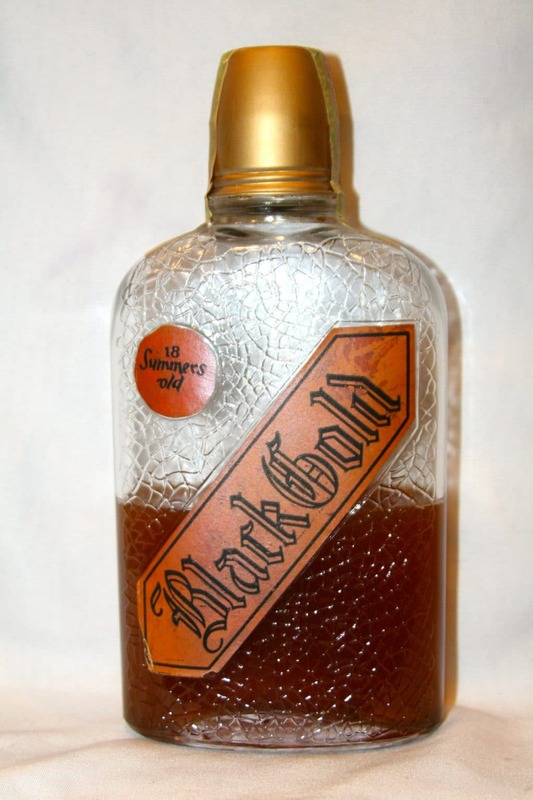 With that said, let’s take a look at a broken Brand Promise: Black Gold. Distributed in the State of New York by the National Straight Whiskey Distributing Company Incorporated (somehow this pint made it to California judging by the tax stamp). 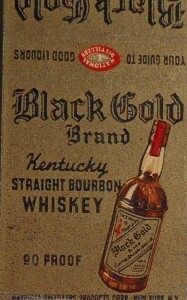 Made in Kentucky, bottled in Maryland, distributed out of New York, sold in California. Whew! Our next two bottles are interesting for a couple of reasons. At first glance, they look identical as long as you overlook that one is contaminated. Anyway, both are in exactly the same embossed glass bottles that prominently feature the Black Gold and National Distillers logos on the reverse. By the time these pints came out National Distillers had purchased AMS and bottled under that name for several years after Repeal. The other interesting thing is both of these bottles feature the “Federal Law Forbids Sale or Reuse of this Bottle“, which is a dead giveaway these bottles are post-prohibition. Here’s the stats for this Black Gold. Unfortunately, the tax stamp is illegible except for the dates. This bottle of liquored wood is another example of something special that was made before The Great Fail and bottled a year after Repeal. 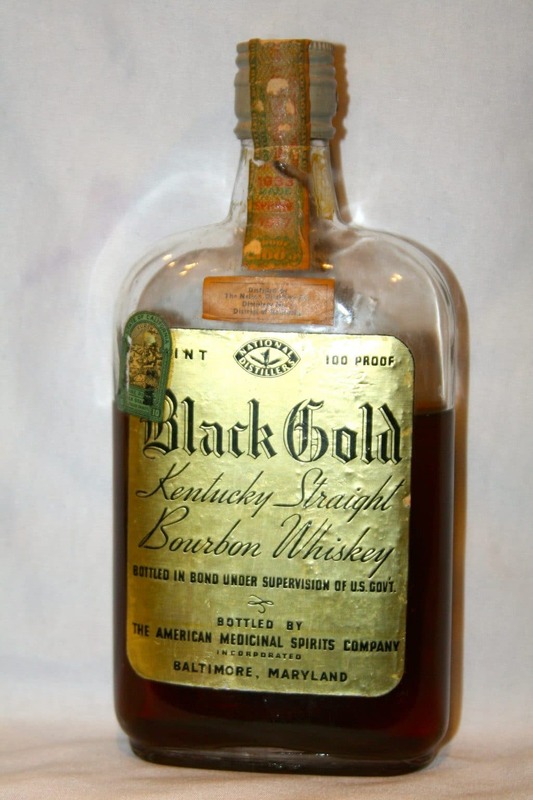 Somehow this whiskey straddled the entire mess of Prohibition. It went to sleep and woke up 18 years later much like the ill-fated crew of the Nostromo from the movie Alien. The mystery with this bottle, unlike its sleepy predecessor, is what’s left of the booze was made in 1917, bottled in 1932 and has the post-prohibiton “Federal Law Forbids” embossing on the glass. 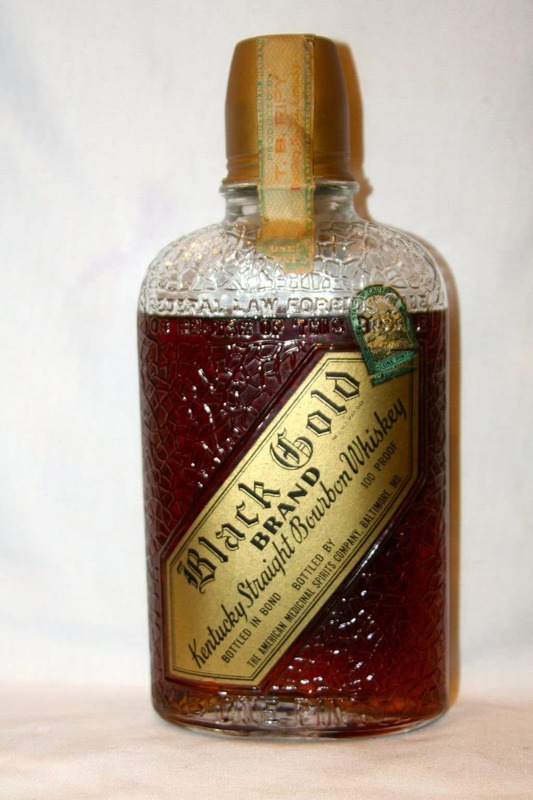 Based on my research this bottle could very well be a solid example of a re-bottling so this leftover whiskey could be sold legally after Repeal. Now that I have presented the facts, you are probably just as confused as I am as to what the Brand Promise of Black Gold is. The common threads are the brand name and the bottler, although hailing from two different cities: Baltimore and Louisville. 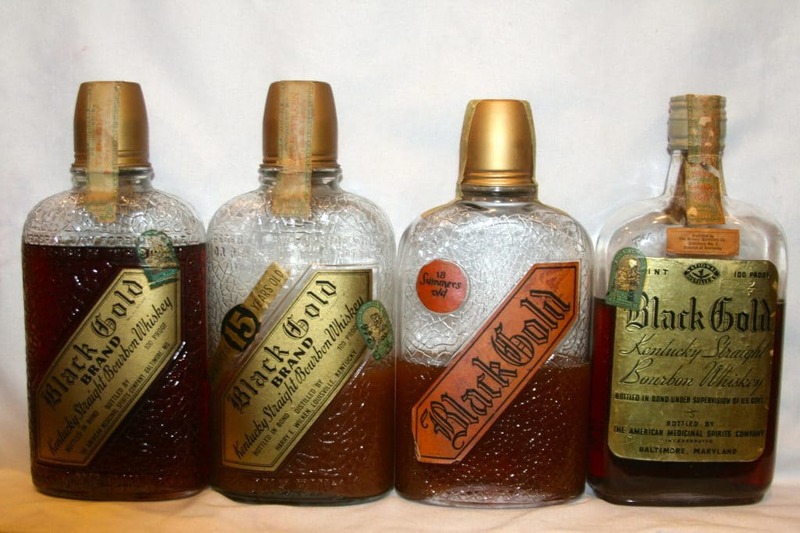 However, not one of these bottles of Black Gold were distilled by the same distiller. Which distillery has the pedigree to stand behind the brand? White? Nelson? Ripy? Wilken? Could we trust any of them to give us The Real Thing, whatever that is? I’m sure they would have all said yes. Just to add to the confusion–I just got a 1/2 pint bottle of Black Gold distilled in 1915 by The Commercial Distilling Company of Terre Haute, IN in 1915 and bottled by the AMS Co. in Louisville post-Repeal in 1934! That is awesome! Is it “Kentucky Straight Bourbon Whiskey”. I don’t see how it can be if it was distilled in Terre Haute. Also, does it have the “Federal Law Forbids” statement embossed on the glass? I love these puzzles. Send a photo through the contact form on this site so we can add it to this post.